These breakout boards come mounted in an attractive case, and they bring all fifteen pins plus shield of a DB15 connector out to spring terminal blocks for easy connection and prototyping work. They are available with either Thumbscrews or Jack Screws for connector hardware, and Spring Terminals for wire connections. See Pricing table below for all part numbers. This breakout board is perfect for production applications as well as experimentation and prototype work. 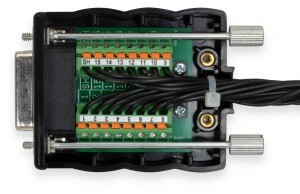 They are well-suited for interfacing with data acquisition equipment or any other devices that use a DB15 connector. A breakout board is sometimes referred to as a "transition module", "terminal board", "terminal block", "breakout box", "breakout adapter", "terminator", or "interface module". The breakout board comes already installed in a sturdy black plastic hood enclosure with a removable cover. A hole in the end provides ample space for conductors to exit the enclosure, and a convenient strain-relief feature allows wires to be easily secured with a zip tie in just seconds. A curved channel guides the zip tie (which is included with the board) around the wire bundle and back up for cinching. This product is available with spring terminals. Spring Terminals (BRKEGDx) allow connections to be made very quickly and efficiently. Simply depress the actuator button on top of the terminal block, insert or remove the wire, and release the button. Thumbscrews (-T option): These work well for attaching the product directly to a piece of equipment; the male threads on the thumbscrews directly engage the female threads on the equipment. Jack Screws (-R option): These provide female threads on the product and work well when attaching the product to a cable, which typically has male thread thumbscrews. These thin cable ties work very well as strain relief on a variety of Winford breakout boards, including boards in the BRKE series. They are a great choice for tying both small and large wire bundles to the breakout boards.